Bhutan tour a greatest cultural adventure of a lifetime - Bhutan west to east tour with Nepal!! Nepal and Bhutan tour : Visit two most beautiful Himalayan kingdoms Nepal and Bhutan at one go. The cultural tours to Bhutan will insights to the people, the culture, the traditions, religion and ecology of the country. This Bhutan west to east tour will take you through some of the most picturesque landscapes of spectacular mountain ranges to the lush green valleys. Few things speak louder and carry more meaning than first-hand experiences and personal testimony..
Bhutan is cradled in the deep folds of the Himalayas. Very little has been heard of Bhutan and to most people it is a hidden kingdom shrouded in mystery. It is classed as one of the most exotic destinations in the world today. The last Shangri-la on Earth! Come explore and unravel the untouched wonders of Bhutan for yourself. Snow-capped mountains, emerald green landscapes, fascinating wildlife, impressive Dzongs and gentle Buddhist people all await you. Experience the hospitality of the Bhutan with Earthbound Expeditions experts in organizing Nepal Bhutan tour. The cultural tours to Bhutan will insights to the people, the culture, the traditions, religion and ecology of the country. These tours will take you through some of the most picturesque landscapes of spectacular mountain ranges to the lush green valleys. One will see the unique architectural splendors of the Dzongs, monasteries and the traditional Bhutanese houses and witness some intriguing religious festivals. You will also get the opportunity to taste the exotic Bhutanese cuisine and meet the friendly people. Best way to enjoy two beautiful Himalayan kingdoms ( Nepal - Bhutan) at one visit. A cultural tour to Bhutan serves as an introduction to our heritage by visiting festivals, and sacred pilgrimage sites, rural villages, and temples of Bhutan, in the tour there will be many stops for panoramic views of the valleys and mountain peaks—chances to enjoy the country’s unspoiled nature. This Nepal Bhutan adventure tour also can be combined with Rajesthan of India ( Taj Mahal, Jaipur, Delhi) or with Tibet ( Lhasa) Darjeeling, Sikkim or the Buddhist circuit tour like Lumbini, Boudhgaya, Kushinagar and Sarnath. Please ask us for the details. Bhutan tour targeting some festivals also available, please write us for details. Join the Bumthang Festival at middle of Nov. each year. In Bumthang festival at mid-night we take a walk to the Jambay Lhakhang and witness the festival where the dancers dance around the fire in naked and is said to be the most scared dance and the event of the beginning of the festival Evening witness “Jambay Lhakhang Drup”among the local people where there will be dances consisting of mask dances and folk songs by the local people. The festivals gives the opportunity to interact with the local people and you can immerse yourself with the locality of Bhutan. Bhutan tour a greatest cultural adventure of a lifetime!! Arrival Kathmandu, Nepal, we will come to receive you at the airport. Check into a 3 star Hotel and rest. Check into Hotel. 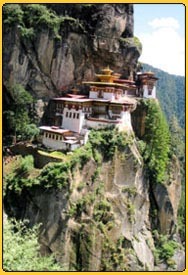 Excursion to Taktsang - Tiger's nest , Drive to Thimpu Overnight at Hotel. Drive to Punakha valley & Wangdi Photang, Phubjikha (Gangtey), overnight in Hotel. Drive to Bumthang (Jakar) via Tongsa Overnight at Hotel. Day 08: Drive to Mongar Sightseeing, Overnight at Hotel. Day 09: Drive to Tashiyangtse, Overnight at Hotel. Day 10: Excursions Tashigang Sightseeing, Overnight at Hotel. Day 11: Drive to Samdrup Jongkhar Overnight at Hotel. Day 12: Exit Bhutan & drive to Guwahati (Indian town) from there either we can continue to Sikkim and Darjeeling tour then to Kathmandu or fly out the Indian other city like Delhi or Culcutta. Price for Bhutan Please ask for the price.